Discussion in 'Boondocking' started by Pirate_Popup, Dec 14, 2015. Trying to figure out what brand etc camp Stove to buy...I usually like to have one to sit on a table adn cook outside my rig. The Disposable Cyl types are $24-$110...can not see a difference exvept some take 2 sizes of disposable cans. Anyone have ANY advice on a good quality one? Seemed simple until I found Walmart. Then the Coleman's looked expensive adn exactly the same as the Ozark Walmart brands. Help! I am personally a fan of white gas stoves and our family camp stove is a Coleman two-burner model. 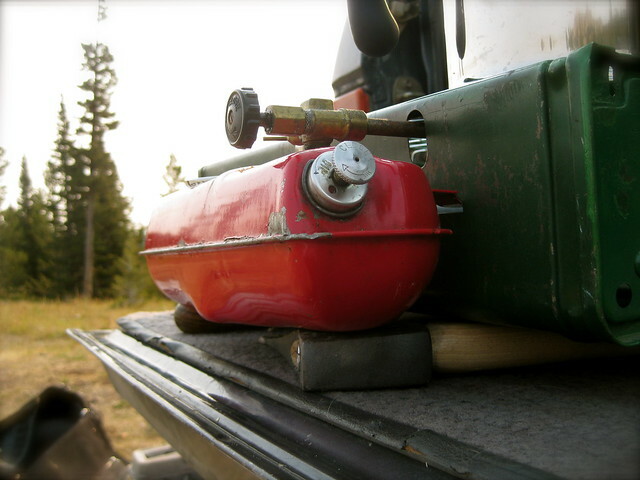 It is slower to bring water to a boil than propane but the trade-off is that you store the fuel in the included tank that fits inside the stove when traveling. This compactness makes it good for more than just popup use as we take it along when we're camping in the back of the truck or when we go on a river rafting trip. greige matter, Katskamper, Blackripley and 2 others like this. We used to have the above Coleman stove, but we purchased a propane 2 burner Coleman stove about 10-15 years ago and are very happy with it. We can use either the little green bottles or have a hose hooked up to the pup's propane tank with the adapter. Lately we have been using the little green bottles and keep the stove on the picnic table. 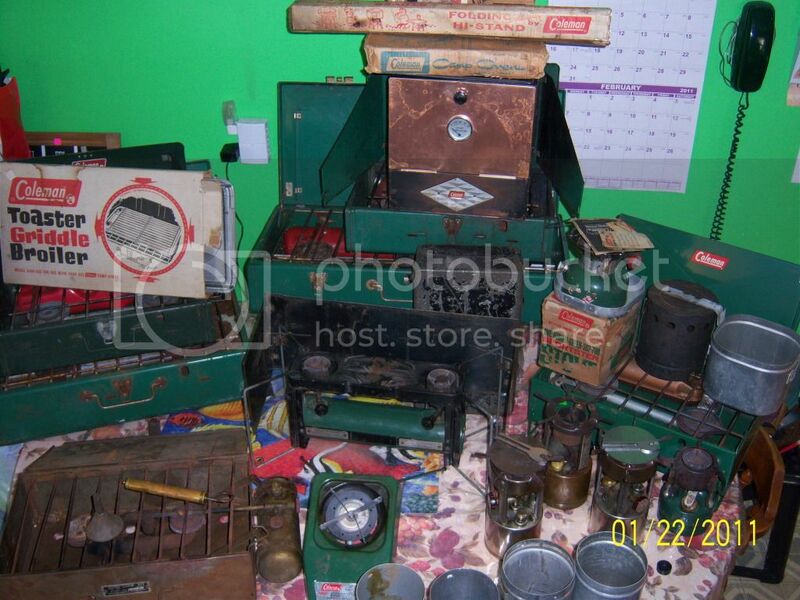 We also did purchase another Coleman propane stove back in 2010 that has an ignitor built in. Just push the red button and it lights. The propane stoves do have a higher BTU rating and thus boil water faster. We have both white gas and propane. The propane is handy, but we prefer the white gas. Heat output about the same, convenience major differences. 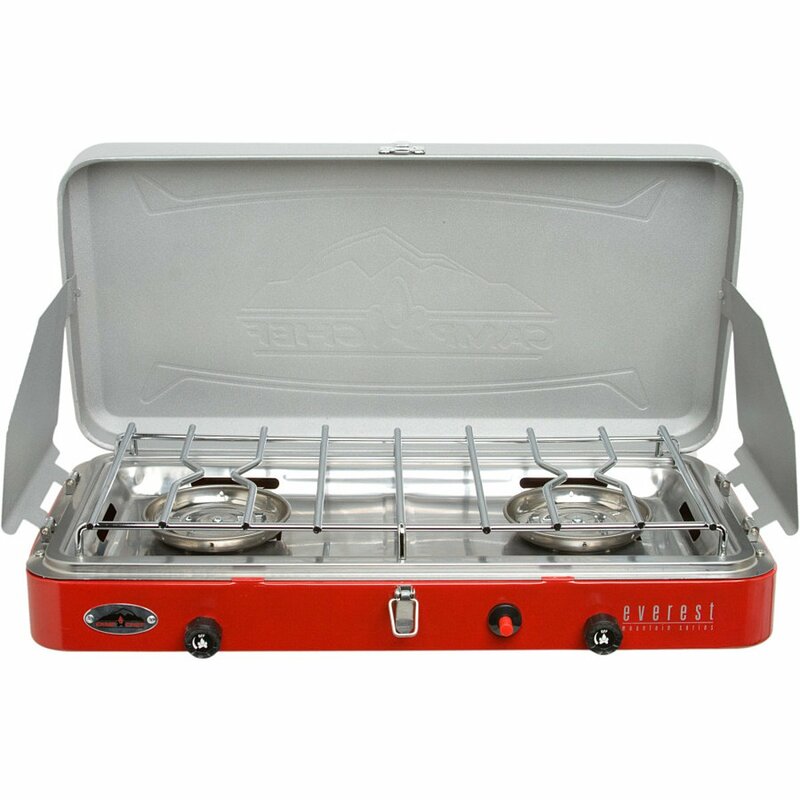 If you are car camping and don't mind the size, get a Camp Chef 2 burner stove. They seem to be $80-$100 here in Utah. Not sure in other parts of the country. They make griddles that fit and are very nice. Each burner puts out 30,000 btu's which will cook a lot. They hook up to a full size propane bottle. I camp often with the boy scouts and this stove is awesome to feed a group. If you need something more compact, my favorite and current stove is the Camp Chef Everest Stove. This is a bit more expensive than the Coleman propane stoves but both burners put out 20,000 btu's which is about twice the power of the $40 Coleman stoves they sell at Walmart etc. It hooks up to a small propane tank or buy an adapter and hook it up to a big tank. FYI- I don't work for Camp Chef, just really like their stoves! gladecreekwy, Garrity and ArizonaJoe like this. We still use our white gas Coleman stoves - we have three, but usually only take one. I've not been impressed by either the dual fuel or propane ones. Camping friends changed to another brand of LP stove last year -with both that and the older Coleman LP stove, they got better, more even cooking with a bulk 5# LP tank. However, they occasionally take it with just the 1# canister if they're doing a short trip. 2. Lights easy. I prefer a push button starter since I can never seem to find a fire stick or match right when I want to cook. So, Push Button Start. 3. Easy to clean surface. Eventually, a pot of something goopy is going to find it's way into the stove. The fewer nooks and crannies makes cleaning it at a CG that much easier. Also, smooth, shiny surfaces release easier that textured surfaces. The easier it is to clean, the better you can do in the rain, in the dark, in the cold, when your dinner went in the stove versus your belly. Anyway, that's my spin, and why I USED to have a Coleman until my son lost it, and now I have an Ozark Mtn with easy to clean surfaces. BUT, when I have the PUP, I use the PUP stove for sheer ease. I also use the JetBoil when packing light. Coleman Stove is my choice. I have 1 burner, 2 burner and 3 burner, depending on the situation. Rik Peery, rich2, bobinfleet and 2 others like this. I have a Coleman single burner stove with a grill and have the griddle attachment. I just use the burner only for my Coleman drip coffee maker. I also have a 3 burner Campchef stove with a two burner griddle that I use most of the time. 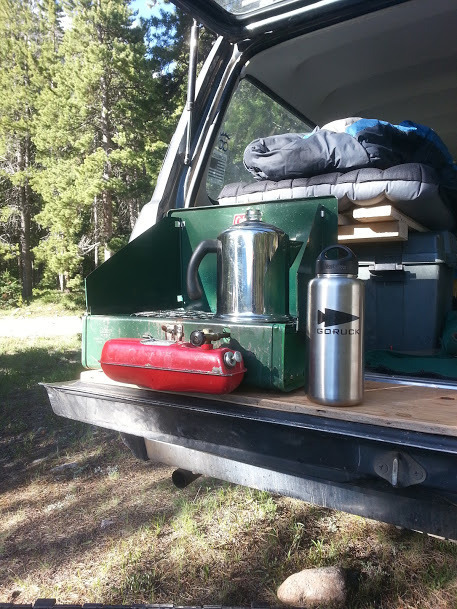 There is a 3 burner stove with a oven in my TT that I have use only a couple of times to boil water in a kettle. I don't like cooking inside because of the food odours. Yes, it's a process to light, but the process isn't difficult once you learn it. It sips fuel, and you can start each trip with a full tank, so we don't take any extra fuel unless we're gone for more than two weeks. Another nice thing about white gas is that it heats very well regardless of outdoor temperature. The stoves that use small propane canisters rely on the ambient heat to pressurize the cylinder, and as the fuel vaporizes, it gets cold. This causes those canisters to be very weak in cold weather. If you only cook in t-shirt weather, this won't bother you, but if you ever try to make a hot breakfast when there's frost on the ground, you'll appreciate the cold weather performance of white gas (or else a big bulk cylinder of propane). rich2 and Katskamper like this. I love my Coleman liquid fuel stoves. I have a stack about 5 ft high. I mostly use a 3 burner model when camping...You can often find like new ones at yard sales and flea markets for very little money. When tent camping I use a 3 burner Coleman white gas unit I've had for 35 years. I use the propane stove and a 2 burner Camp Chef when using the camper. Camp Chef Explorer - hands down the best stove on the market. I forgot to mention that we also have a Coleman Road Trip grill with stove inserts. If you don't know about the Road Trip, it can act as a grill, stove, or griddle. I have the Road Trip LX (the blue one). We also have the non-stick griddle inserts. This grill works well. It doesn't always go with us. We use it home mostly when cooking large meals outside on the patio. All great answers and fabulous advice and I thank you all...I like the idea of being able to have the 2 fuel options of the White Gas units. One big concern though as I camp out of my Van is possible leakage of White Gas. Would storing the White Gas stoves in a saaay Tupperware type container be ok? The Gallon itself for refilling should be fine..I just wonder about the stove tanks..for smell on over spill etc. I would not store white gas in plastic. I would purchase an MSR 30 OZ fuel bottle. I use them when backpacking and they do not leak. They are also metal. There are some plastics that can be dissolved by gasoline. I'm not sure if Tupperware is one of them, but I consider most plastics to be unsafe until proven safe. I remember one time I tried to carry a small quantity of gasoline in a Styrofoam cup. The cup dissolved instantly. Having said that, the tank in a Coleman stove is very robust. It needs to be able to withstand being pressurized. I've never had an issue with leakage, and I've carried mine thousands of miles over the years, up and down the Rocky Mountains, Sierra Nevada, and other mountain ranges. I do depressurize the tank (open the filler cap completely, then close it tightly) before packing it away in the car. I'm not sure if that routine is overkill, but it's what I do. I carry spare fuel in metal Sigg fuel bottles, on those rare times when I think I might need it. Those bottles aren't made any more, but MSR and others make basically the same thing. They are sturdy metal bottles designed for transporting fuel. Amazon has the MSR 30 oz fuel bottle for $19.95. They also have the Primus 1.5L fuel bottle for $24.00.